CHARMING COTTAGE IN TOWN! 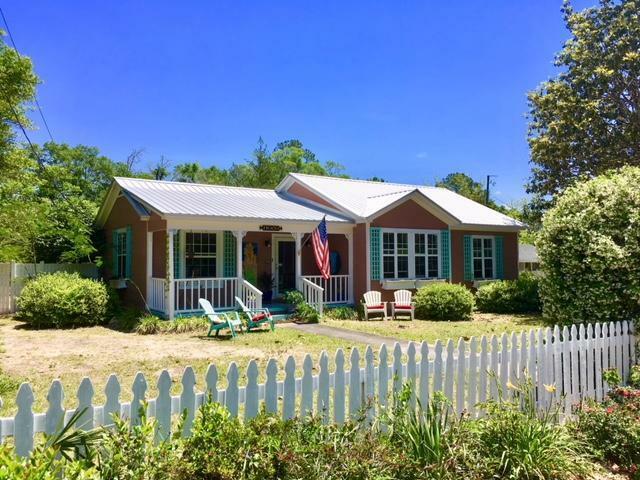 Known as Mermaid Cottage, this adorable 2BR 2BA home is located just a few blocks from Lake DeFuniak and downtown. Front & back porches on this updated 1940 cottage allow enjoyment of the 1/3 acre fenced lot, sporting fragrant jasmine hedges, privacy decks, and a 12'x18' yard building. Attached one-car garage has direct access to the house. The open kitchen with newer stainless appliances plus gas range flows into a dining area and den/sitting room. Original oak floors lead to the living room with fireplace, foyer, and two spacious bedrooms. One Bath features an oversize jetted tub, and the other has a walk-in shower. Built-in shelving, crown molding & beaded wainscoting throughout the house. Washer/Dryer included. Plus newer central heat & air and metal roof.